USB interface to use the Virtual Trainer website of Life Fitness - plan your workout much better and analyse your training sessions in detail! Ambitious sportsmen, who attach a great importance to a workout full of energy, will have a lot of fun with the Life Fitness exercise bike C1 Track Connect. The frame construction, loadable up to 135 kg, makes the Life Fitness C1 Track a durable training partner. Comfort is given as well: the comfortable saddle is 14 times adjustable, the ergonomic multi-position handlebar offers many grip varieties. Furthermore, the Life Fitness exercise bike C1 Track Connect has self-aligning strap pedals for safe stability while exercising. 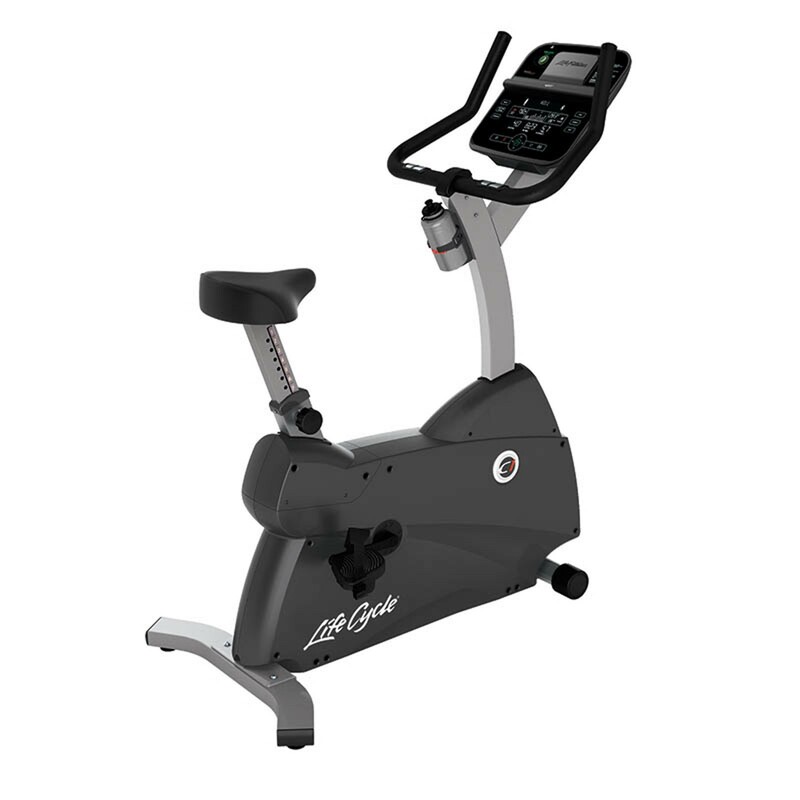 The Life Fitness exercise bike C1 Track Connect is equipped with a clearly structured console. The training computer is intuitively operable and offers a quick selection of programme settings. The Life Fitness exercise bike C1 Track Connect has a big LCD display informing clearly about important training data like distance, time, energy consumption, etc.. You always monitor your workout. The Track Connect console is divided in two zones: the enterntainment zone and the training zone. In the lower training zone, you can quickly do all training settings. Here, the Track Connect console offers 15 diversified training programmes as standard. It includes five heart rate programmes, among other things for increasing the maximum performance or for fat burning. A very efficient programme, when you only have little time for training: the HIIT programme – a highly intensive intervall training. The Connect console offers the possibility to place a smartphone or a tablet and to connect it with the device via Bluetooth. For mobile devices, many fitness Apps are available as download, i. e., the Apps of Garmin, Jawbone or Fitbit. You can call your training data from a permanently updated list of partner Apps. Of course, you can also use your mobile device to watch a film while exercising. The Track Connect console is also equipped with an energy save mode for saving up to 90 % of the current. Life Fitness exercise bike C1 Track Connect add to comparison list.